All transactions are safe and secure with a reliable history in online purchasing behind each of our associates. Buy the Thank You for Being a Friend t-shirt to own Golden Girls clothing and merchandise. Thank you for being a friend, traveled down the road and back again... We all know the touching lyrics. The Golden Girls theme song is as recognizable as the girls themselves. This Golden Girls t-shirt features the noted line and all the memories attached to it. Recall the hilarious escapades and heartfelt moments of the characters, including Blanche Devereaux, Dorothy Zbornak, Rose Nylund and Sophia Petrillo as they embrace the theme song's lyrics in each episode. Give this tee as a gift to say, "Your heart is true, you're a pal and a confidant, thank you for being a friend." 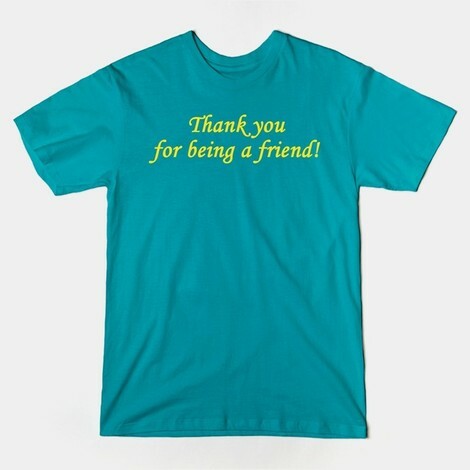 In addition to the Thank You for Being a Friend tee above, browse the Golden Girls Clothing Gallery for more apparel like men's and women's clothes, kids shirts or hoodies.